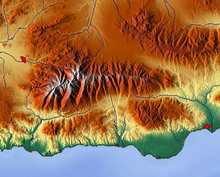 A digital elevation model (DEM) is a 3D CG representation of a terrain's surface – commonly of a planet (e.g. Earth), moon, or asteroid – created from a terrain's elevation data. A "global DEM" refers to a Discrete Global Grid. DEMs are used often in geographic information systems, and are the most common basis for digitally produced relief maps. While a DSM may be useful for landscape modeling, city modeling and visualization applications, a DTM is often required for flood or drainage modeling, land-use studies, geological applications, and other applications, and in planetary science. Surfaces represented by a Digital Surface Model include buildings and other objects. Digital Terrain Models represent the bare ground. There is no universal usage of the terms digital elevation model (DEM), digital terrain model (DTM) and digital surface model (DSM) in scientific literature. In most cases the term digital surface model represents the earth's surface and includes all objects on it. In contrast to a DSM, the digital terrain model (DTM) represents the bare ground surface without any objects like plants and buildings (see the figure on the right). DEM is often used as a generic term for DSMs and DTMs, only representing height information without any further definition about the surface. Other definitions equalise the terms DEM and DTM,, equalise the terms DEM and DSM , define the DEM as a subset of the DTM, which also represents other morphological elements , or define a DEM as a rectangular grid and a DTM as a three-dimensional model (TIN). Most of the data providers (USGS, ERSDAC, CGIAR, Spot Image) use the term DEM as a generic term for DSMs and DTMs. All datasets which are captured with satellites, airplanes or other flying platforms are originally DSMs (like SRTM or the ASTER GDEM). It is possible to compute a DTM from high resolution DSM datasets with complex algorithms (Li et al., 2005). In the following, the term DEM is used as a generic term for DSMs and DTMs. A DEM can be represented as a raster (a grid of squares, also known as a heightmap when representing elevation) or as a vector-based triangular irregular network (TIN). The TIN DEM dataset is also referred to as a primary (measured) DEM, whereas the Raster DEM is referred to as a secondary (computed) DEM. 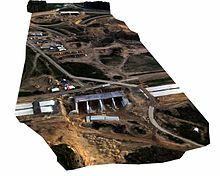 The DEM could be acquired through techniques such as photogrammetry, lidar, IfSAR, land surveying, etc. (Li et al. 2005). DEMs are commonly built using data collected using remote sensing techniques, but they may also be built from land surveying. The digital elevation model itself consists of a matrix of numbers, but the data from a DEM is often rendered in visual form to make it understandable to humans. This visualization may be in the form of a contoured topographic map, or could use shading and false color assignment (or "pseudo-color") to render elevations as colors (for example, using green for the lowest elevations, shading to red, with white for the highest elevation.). 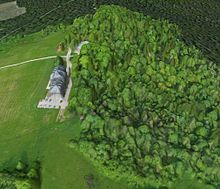 Visualizations are sometime also done as oblique views, reconstructing a synthetic visual image of the terrain as it would appear looking down at an angle. In these oblique visualizations, elevations are sometimes scaled using "vertical exaggeration" in order to make subtle elevation differences more noticeable. Some scientists,  however, object to vertical exaggeration as misleading the viewer about the true landscape. Mappers may prepare digital elevation models in a number of ways, but they frequently use remote sensing rather than direct survey data. Older methods of generating DEMs often involve interpolating digital contour maps that may have been produced by direct survey of the land surface. This method is still used in mountain areas, where interferometry is not always satisfactory. Note that contour line data or any other sampled elevation datasets (by GPS or ground survey) are not DEMs, but may be considered digital terrain models. A DEM implies that elevation is available continuously at each location in the study area. One powerful technique for generating digital elevation models is interferometric synthetic aperture radar where two passes of a radar satellite (such as RADARSAT-1 or TerraSAR-X or Cosmo SkyMed), or a single pass if the satellite is equipped with two antennas (like the SRTM instrumentation), collect sufficient data to generate a digital elevation map tens of kilometers on a side with a resolution of around ten meters. Other kinds of stereoscopic pairs can be employed using the digital image correlation method, where two optical images are acquired with different angles taken from the same pass of an airplane or an Earth Observation Satellite (such as the HRS instrument of SPOT5 or the VNIR band of ASTER). The SPOT 1 satellite (1986) provided the first usable elevation data for a sizeable portion of the planet's landmass, using two-pass stereoscopic correlation. Later, further data were provided by the European Remote-Sensing Satellite (ERS, 1991) using the same method, the Shuttle Radar Topography Mission (SRTM, 2000) using single-pass SAR and the Advanced Spaceborne Thermal Emission and Reflection Radiometer (ASTER, 2000) instrumentation on the Terra satellite using double-pass stereo pairs. The HRS instrument on SPOT 5 has acquired over 100 million square kilometers of stereo pairs. MOLA digital elevation model showing the two hemispheres of Mars. This image appeared on the cover of Science magazine in May 1999. A tool of increasing value in planetary science has been use of orbital altimetry used to make digital elevation map of planets. A primary tool for this is Laser altimetry. Planetary digital elevation maps made using laser altimetry include the Mars Orbiter Laser Altimeter (MOLA) mapping of Mars, the Lunar Orbital Laser Altimeter (LOLA) and Lunar Altimeter (LALT) mapping of the Moon, and the Mercury Laser Altimeter (MLA) mapping of Mercury. Reference 3D products include quality masks that give information on the coastline, lake, snow, clouds, correlation etc. Digital Surface Model of motorway interchange construction site. Note that tunnels are closed. A free DEM of the whole world called GTOPO30 (30 arcsecond resolution, approx. 1 km along the equator ) is available, but its quality is variable and in some areas it is very poor. A much higher quality DEM from the Advanced Spaceborne Thermal Emission and Reflection Radiometer (ASTER) instrument of the Terra satellite is also freely available for 99% of the globe, and represents elevation at 30 meter resolution. A similarly high resolution was previously only available for the United States territory under the Shuttle Radar Topography Mission (SRTM) data, while most of the rest of the planet was only covered in a 3 arc-second resolution (around 90 meters along the equator). SRTM does not cover the polar regions and has mountain and desert no data (void) areas. SRTM data, being derived from radar, represents the elevation of the first-reflected surface — quite often tree tops. So, the data are not necessarily representative of the ground surface, but the top of whatever is first encountered by the radar. Submarine elevation (known as bathymetry) data is generated using ship-mounted depth soundings. When land topography and bathymetry is combined, a truly Global Relief Model is obtained. The SRTM30Plus dataset (used in NASA World Wind) attempts to combine GTOPO30, SRTM and bathymetric data to produce a truly global elevation model. The Earth2014 global topography and relief model  provides layered topography grids at 1 arc-minute resolution. Other than SRTM30plus, Earth2014 provides information on ice-sheet heights and bedrock (that is, topography below the ice) over Antarctica and Greenland. Another global model is Global Multi-resolution Terrain Elevation Data 2010 (GMTED2010) with 7.5 arc second resolution. It is based on SRTM data and combines other data outside SRTM coverage. A novel global DEM of postings lower than 12 m and a height accuracy of less than 2 m is expected from the TanDEM-X satellite mission which started in July 2010. The most common grid (raster) spacing is between 50 and 500 meters. In gravimetry e.g., the primary grid may be 50 m, but is switched to 100 or 500 meters in distances of about 5 or 10 kilometers. Since 2002, the HRS instrument on SPOT 5 has acquired over 100 million square kilometers of stereo pairs used to produce a DTED2 format DEM (with a 30-meter posting) DEM format DTED2 over 50 million km². The radar satellite RADARSAT-2 has been used by MacDonald, Dettwiler and Associates Ltd. to provide DEMs for commercial and military customers. In 2014, acquisitions from radar satellites TerraSAR-X and TanDEM-X will be available in the form of a uniform global coverage with a resolution of 12 meters. ALOS provides since 2016 a global 1-arc second DSM free of charge , and a commercial 5 meter DSM/DTM . Many national mapping agencies produce their own DEMs, often of a higher resolution and quality, but frequently these have to be purchased, and the cost is usually prohibitive to all except public authorities and large corporations. DEMs are often a product of national lidar dataset programs. Free DEMs are also available for Mars: the MEGDR, or Mission Experiment Gridded Data Record, from the Mars Global Surveyor's Mars Orbiter Laser Altimeter (MOLA) instrument; and NASA's Mars Digital Terrain Model (DTM). OpenTopography is a web based community resource for access to high-resolution, Earth science-oriented, topography data, and related tools and resources that houses large volumes of DEM data. OpenTopography is based at the San Diego Supercomputer Center at the University of California, San Diego and is operated in collaboration with colleagues in the School of Earth and Space Exploration at Arizona State University and UNAVCO. Core operational support for OpenTopography comes from the National Science Foundation Earth Sciences: Instrumentation and Facilities Program (EAR/IF). The OpenDemSearcher is a Mapclient with a visualization of regions with free available middle and high resolution DEMs. The US Geological Survey produces the National Elevation Dataset, a seamless DEM for the United States, Hawaii and Puerto Rico based on 7.5' topographic mapping. As of the beginning of 2006, this replaces the earlier DEM tiled format (one DEM per USGS topographic map). 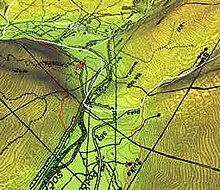 OpenTopography is a U.S.-based community access source of a large amount of high-resolution topography data for the U.S.
^ I. Balenovic, H. Marjanovic, D. Vuletic, etc. Quality assessment of high density digital surface model over different land cover classes. PERIODICUM BIOLOGORUM. VOL. 117, No 4, 459–470, 2015. ^ "Appendix A – Glossary and Acronyms" (PDF). Severn Tidal Tributaries Catchment Flood Management Plan – Scoping Stage. UK: Environment Agency. Archived from the original (PDF) on 2007-07-10. ^ "Intermap Digital Surface Model: accurate, seamless, wide-area surface models". Archived from the original on 2011-09-28. ^ Li, Z., Zhu, Q. and Gold, C. (2005), Digital terrain modeling: principles and methodology, CRC Press, Boca Raton, FL. ^ Hirt, C. (2014). "Digital Terrain Models". Encyclopedia of Geodesy: 1–6. doi:10.1007/978-3-319-02370-0_31-1. ISBN 978-3-319-01868-3. Retrieved February 10, 2016. ^ Peckham, Robert Joseph; Jordan, Gyozo (Eds. )(2007): Development and Applications in a Policy Support Environment Series: Lecture Notes in Geoinformation and Cartography. Heidelberg. ^ Podobnikar, Tomaz (2008). "Methods for visual quality assessment of a digital terrain model". S.A.P.I.EN.S. 1 (2). ^ Adrian W. Graham,Nicholas C. Kirkman,Peter M. Paul (2007): Mobile radio network design in the VHF and UHF bands: a practical approach. West Sussex. ^ "DIN Standard 18709-1". Archived from the original on 2011-01-11. ^ "Landslide Glossary USGS". Archived from the original on 2011-05-16. ^ Making 3D Terrain Maps, Shaded Relief. Retrieved 11 March 2019. 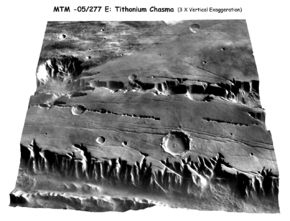 ^ David Morrison, "“Flat‐Venus Society” organizes", EOS, Volume 73, Issue 9, American Geophysical Union, 3 March 1992, p. 99. https://doi.org/10.1029/91EO00076. Retrieved 11 March 2019. ^ Robert Simmon, "Elegant Figures What Not To Do: Vertical Exaggeration," NASA Earth Observatory, November 5, 2010. Retrieved 11 March 2019. ^ "WorldDEM(TM): Airbus Defence and Space". www.intelligence-airbusds.com. ^ a b Nikolakopoulos, K. G.; Kamaratakis, E. K; Chrysoulakis, N. (10 November 2006). "SRTM vs ASTER elevation products. Comparison for two regions in Crete, Greece" (PDF). International Journal of Remote Sensing. 27 (21): 4819–4838. doi:10.1080/01431160600835853. ISSN 0143-1161. Archived from the original (PDF) on July 21, 2011. Retrieved June 22, 2010. ^ Bruce Banerdt, Orbital Laser Altimeter, The Martian Chronicle, Volume 1, No. 3, NASA. Retrieved 11 March 2019. ^ NASA, LOLA. Retrieved 11 March 2019. ^ John F. Cavanaugh, et al., "The Mercury Laser Altimeter Instrument for the MESSENGER Mission", Space Sci Rev, DOI 10.1007/s11214-007-9273-4, 24 August 2007. Retrieved 11 March 2019. ^ a b Campbell, D. M. H.; White, B.; Arp, P. A. (2013-11-01). "Modeling and mapping soil resistance to penetration and rutting using LiDAR-derived digital elevation data". Journal of Soil and Water Conservation. 68 (6): 460–473. doi:10.2489/jswc.68.6.460. ISSN 0022-4561. ^ James, M. R.; Robson, S. (2012). "Straightforward reconstruction of 3D surfaces and topography with a camera: Accuracy and geoscience application". Journal of Geophysical Research: Earth Surface. 117: n/a. doi:10.1029/2011JF002289. ^ "I. Balenović, A. Seletković, R. Pernar, A. Jazbec. Estimation of the mean tree height of forest stands by photogrammetric measurement using digital aerial images of high spatial resolution. ANNALS OF FOREST RESEARCH. 58(1), P. 125-143, 2015". ^ "Martin Gamache's paper on free sources of global data" (PDF). ^ Hirt, C.; Rexer, M. (2015). "Earth2014: 1 arc-min shape, topography, bedrock and ice-sheet models - available as gridded data and degree-10,800 spherical harmonics" (PDF). International Journal of Applied Earth Observation and Geoinformation. 39: 103–112. doi:10.1016/j.jag.2015.03.001. Retrieved February 20, 2016. ^ "GEO Elevation Services : Airbus Defence and Space". www.astrium-geo.com. ^ "International - Geospatial". gs.mdacorporation.com. ^ "TerraSAR-X : Airbus Defence and Space". www.astrium-geo.com. ^ "ALOS World 3D - 30m". www.eorc.jaxa.jp. ^ "ALOS World 3D". www.aw3d.jp. ^ "A basic guide for using Digital Elevation Models with Terragen". Archived from the original on 2007-05-19. ^ a b "About OpenTopography". ^ "San Diego Supercomputer Center". www.sdsc.edu. Retrieved 2018-08-16. ^ "Home | UNAVCO". www.unavco.org. Retrieved 2018-08-16. ^ "Error 404 – Page not found". herbert.gandraxa.com. Hirt, C.; Filmer, M.S. ; Featherstone, W.E. (2010). "Comparison and validation of recent freely-available ASTER-GDEM ver1, SRTM ver4.1 and GEODATA DEM-9S ver3 digital elevation models over Australia". Australian Journal of Earth Sciences. 57 (3): 337–347. doi:10.1080/08120091003677553. Retrieved May 5, 2012. Rexer, M.; Hirt, C. (2014). "Comparison of free high-resolution digital elevation data sets (ASTER GDEM2, SRTM v2.1/v4.1) and validation against accurate heights from the Australian National Gravity Database" (PDF). Australian Journal of Earth Sciences. 61 (2): 213–226. doi:10.1080/08120099.2014.884983. Archived from the original (PDF) on June 7, 2016. Retrieved April 24, 2014. This page was last edited on 16 March 2019, at 00:19 (UTC).